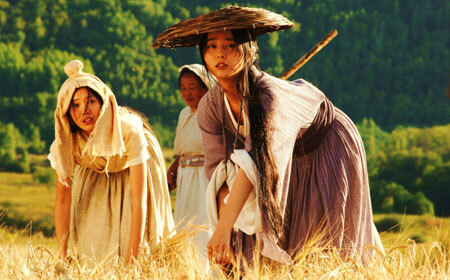 Fan Bingbing tends the fields in Wheat. The Skinny: Beautifully-made historical drama set during the Warring States period. Director He Ping doesn't fully capitalize on his situations, but the resulting film is still a tense, well-acted and engrossing drama. The golden wheat fields are gorgeous - but maybe not as gorgeous as leading lady Fan Bing-Bing. by Kozo: Director He Ping's Wheat takes place during China's Warring States Period, specifically the conflict between the states of Zhao and Qin. The history books state that Qin was the eventual winner, but those not versed in history should still know about Qin's dominance since they probably saw how kickass the Qin were in such fine films as Hero, The Emperor and the Assassin, and, yep, The Mummy: Tomb of the Dragon Emperor. Basically, the Qin won, united China, appointed Qin Shi-Huang as China's First Emperor, and made the people of Zhao their subjects. Everybody should know that the Qin figuratively and literally ruled. However, insanely beautiful Zhao citizen Lady Li (Fan Bing-Bing) doesn't know, though her lack of Qin knowledge is far from her fault. Lady Li presides over the remote Zhao town of Lu Yi, composed entirely of women ever since Lady Li's beloved, Lord Cu Jong (Wang Xueqi), left to fight the Qin along with all of Lu Yi's men. Left alone, the women tend Lu Yu's golden fields of wheat while anxiously awaiting word from the front. Two soldiers, Xia (Huang Jue) and Zhe (Du Jiayi) wash up on the riverbank, and after awakening they bring news that Zhao has emerged triumphant. However, they're not being straight with the ladies – Qin actually triumphed, Lu Yi's men are all dead, and it's only a matter of time before Qin soldiers start trampling their lovely wheat. It'll be bad times all around, and Xia and Zhe can help if they just come clean. But they won't, and here's why: Xia and Zhe are (not a spoiler!) really AWOL Qin soldiers, and telling a bunch of Zhao women that they're the enemy – plus that the Zhao men are dead – would be unwise. Their reasons for going AWOL differ somewhat; Zhe is a spineless coward who wants to escape the battlefield, while Xia is an elite warrior who's abandoning the soldiering life because he's tired and its harvest time in his hometown, where they grow – what else – wheat. However, while fleeing their Zhao comrades, who're instructed to behead any deserters, the two jump from a cliff into a river, eventually ending up in Lu Yi. There, they pretend to be Zhao guys and enjoy the hospitality of the world's most glamorous wheat farmer and her women-only town. Ain't life grand? Well, not really. While Wheat has the makings of an anti-war comedy like Welcome to Dongmakgol, it's decidedly a drama, with the film's tension derived from the two soldiers' deception and Lady Li's growing suspicion that the men aren't exactly telling the truth. The story is an engaging one, and He Ping mounts it admirably with beautiful locations, gorgeous cinematography, and flawless production design. The actors follow suit, giving their performances an obvious but affecting theatricality that works well considering the story's tragic undertones and carefully-arranged production values. At times, Wheat plays like well-adapted theater, with dialogue performed in a strong, purposeful manner. At the same time, visuals carry more than a few sequences and the physical performances are very sharp. Superficially, Wheat is an excellent and compelling film. Digging a little deeper, however, there are some flaws. The film doesn't entirely earn its conclusion, which makes sense but seems to deflate rather than reward the audience. The themes are obviously anti-war, with war's hopelessness and irony taking its toll on everyone involved. However, many of the situations are only subtly explored. The film never develops the connection between Xia and Lady Li, who share little more than a few glances. Also, it's implied that the Zhao men's deception becomes two-sided – that is, while some Zhao women suspect, they play along with the two soldiers if only to keep their world from crashing in. That idea, while exceptionally worthy, is never explored satisfactorily. He Ping creates fine tension, but doesn't fully take advantage of his situations. While the film is thematically involving, it lacks the varied emotions to become truly engaging.